Colonel John Stacpole, C.V.O., C.M.G. John Stacpole served in the army for his entire adult life, rising from the ranks to become a colonel. He served in the major conflicts of the late Victorian era, and during the Boer War was chief embarkation officer at Southampton. John Stacpole was born on 27 December 1847 at Kilcommon, Hollymount, County Mayo in the west of Ireland, the son of Thomas Stacpole (1822–1875), described as a “gentleman farmer”. Unfortunately, no details of John’s mother appear to have survived. There are no records of John’s education or early life until his marriage to Eliza (“Leila”) Smith at St Stephen’s Church in Kensington on 9 January 1872. On the marriage records, both are recorded as resident at Queen’s Gate, South Kensington. Leila was born at Chithurst in Sussex in early 1848, the youngest child of George and Charlotte Smith. In the 1851 census, the family was living at Iping in Sussex, with George described as an agricultural labourer. Ten years later, the family had moved to Portsmouth, where George continued to call himself a labourer. By 1871, however, George was now working as a steward in the officers’ mess at Fort Gomer in Alverstoke, with 25-year old Eliza described as a domestic servant. Following their marriage, John and Leila lived at 103 Albert Road, Hackney, until early 1876, when they moved to Portsmouth. For some reason, the couple had a second marriage ceremony at St James’s Church in Milton, Portsmouth on 12 September 1876. At the time of the 1901 census, John and Leila were living at 3 Shirley Road, Southsea with a cook and a maidservant. Leila died at Shirley Road, Southsea on 3 February 1906, aged 58 from cirrhosis of the kidneys; the couple had no children. On 9 March 1907, John was re-married to 50-year old Isabella Grazebrook in a society wedding at the church of St Peter and St Paul at Cromer, in Norfolk. Originally from Worcestershire, Isabella was the daughter of Michael Grazebrook, an ironmaster who had retired to Portsmouth with his family. Isabella’s younger sister, Beatrice, was the widow of Benjamin Bond Cabbell (1857–1892), the grandson of the late M.P. for Boston of the same name, whose family home was Cromer Hall. Best man at the wedding was Col. Edward A. Bramhall of the Army Service Corps. After their marriage, the couple set up home at “Sharvells” at Milford on Sea. On 15 February 1912, aged 64, John was initiated into Powney Lodge No 3099, at the Masonic Hall at Ashley Road, Lymington, alongside 36-year old clerk, Theodore Charles. Following his initiation, Bro. Stacpole presented to the lodge a gavel made from stone quarried from King Solomon’s Mines in Palestine together with a stone from the same quarries engraved with a square and compasses. These are still in the possession of the Lodge. John was passed to the second degree on 16 May, and raised to the degree of a Master Mason on 18 July 1912. John enlisted in Ireland on 23 November 1865, a few weeks before his 18th birthday, joining the 88th Regiment of Foot (Connaught Rangers) as a private. After seven months training in Ireland, he was sent with the regiment to India on 18 July 1866. He made rapid promotion, becoming a corporal on 27 December 1867 (his 20th birthday), a sergeant a year later and colour sergeant on 28 September 1869, reported as “the youngest of his rank in the whole army”. In November 1870, the regiment boarded the troopship HMS Jumna in Bombay, and commenced the passage home, arriving back in England on 21 December. After eight years in the ranks, on 21 January 1874 John was commissioned as a sub-lieutenant in the 75th (Stirlingshire) Regiment of Foot, and on 11 May 1875, he was promoted to a full lieutenant, backdated to the date of his original commission. Between 16 February 1874 and 30 March 1875, John served with the 75th Foot in South Africa. On 26 July 1876, John transferred to the 17th (Leicestershire) Regiment, based in Ireland, before traveling with the regiment back to India on 4 October that year. Between 7 June and 27 July 1877, he was station staff officer at Indore, 500 miles south of Delhi. He then became the quartermaster at the hill station at Deolali, 100 miles north-east of Bombay (Mumbai) from 21 September 1877 to 29 May 1880. John returned to England with the Leicester Regiment on 8 December 1880 and on 10 April 1882, he was seconded as a Deputy-Assistant Commissary-General, being promoted to captain on 26 March 1884. He served at the port of Suakin at the time of the Soudan expedition in March to May 1885, for which he received the Egypt Medal with the Suakin clasp and the Khedive’s Star. On 11 December 1888, he was attached to the Army Service Corps, becoming a Deputy-Assistant Adjutant-General in the North-East District, based at York, on 1 July 1889. In 1891, he wrote “A Guide to Meat Inspection for Regimental Officers”, with illustrations by Lieut. W.S. Melville, published by Her Majesty’s Stationery Office. While stationed at York, he served on a committee to enquire into the terms and conditions of service for soldiers. On 11 May 1891, John was promoted to a major with the Royal Welsh Fusiliers, thus serving with regiments from all four of the home nations. On 2 April 1892, he joined the Army Service Corps Permanent List, becoming Deputy-Assistant Adjutant-General in the Home District until 30 June 1894. On 15 September 1895, he was appointed Deputy-Assistant Adjutant-General in the Southern District, based at Portsmouth, and was promoted to Lieutenant-Colonel with the Army Service Corps on 13 November 1895. In the latter role, he was the embarkation officer at Southampton Docks, overseeing the embarkation and disembarkation of troops leaving or returning to England. During the Boer War, which lasted from October 1899 to May 1902, John and his staff oversaw the embarkation of 300,000 men and 32,000 horses without any casualties. John was promoted to brevet colonel on 28 March 1900, and as a colonel on the staff on 9 August that year. The ‘laurel leaves’ were duly distributed at the end of the war, and on 19 March 1901, John was appointed a Commander of the Royal Victorian Order. The presentation was made in a private ceremony on board the Royal Yacht, Victoria & Albert, at Portsmouth, during which King Edward VII thanked him for the ‘zeal and fidelity he had displayed in the exercise of his arduous and responsible duties as Embarkation Officer’. This was followed on 26 June 1902, by his appointment to be a Companion of the Order of St Michael and St George. A volume of eulogy could not pay higher tribute to those rare qualities which the brave and kindly Colonel possesses … There is nothing haughty or imperious about his manner; he is always a perfect gentleman, and is approachable by the meanest and poorest. Following his retirement from the Army, John was appointed a Justice of the Peace. In April 1905, John came out of retirement, and was appointed District Barrack Master, Eastern Command under Lord (Paul) Methuen. In this post, he exercised general control of the barracks and was paid an annual salary of £200, as well as receiving his army pension. He retired from this position on 30 November 1907, on reaching the age of 60 years. This worthy man ought not to be allowed to go permanently into retirement without it being placed on record how much the whole British Army owed to him during the war… The whole civilized world knows how admirably the responsible duties owed to Col. Stacpole were discharged, and the perfect system created by him… It was great and laborious work, but Col. Stacpole was up to it, and tact, forbearance, and good temper, added to his great administrative gifts, enabled him to pass nearly the whole of the fighting army through his hands without one hitch occurring to mar his record of unprecedented success in this particular phase of staff duty. On 1 January 1915, John was appointed as Commandant of the rest camp at Highfield, on the north-eastern edge of Southampton Common (on a site now occupied by Southampton University). During John’s time at Highfield, he and Isabella were resident in one of the houses comprising the rest camp. His funeral was conducted with “imposing military ceremonial” at Christ church, Highfield, on 2 January. The coffin was transported from his home at Highfield to the church on a gun-carriage preceded by a firing party and accompanied by a military band. The pall-bearers were six colonels, including Col. E.A. Bramhall. After the funeral service, the coffin remained in the church overnight under military guard provided by the Royal Defence Corps and the following day was taken on the gun-carriage to Southampton West station where it was carried onto a train by six sergeants of the Army Service Corps. The coffin was then transported to Brookwood Cemetery near Woking for cremation. Isabella only survived her husband by ten months, dying at the couple’s home in Highfield on 30 October 1917, aged 61. 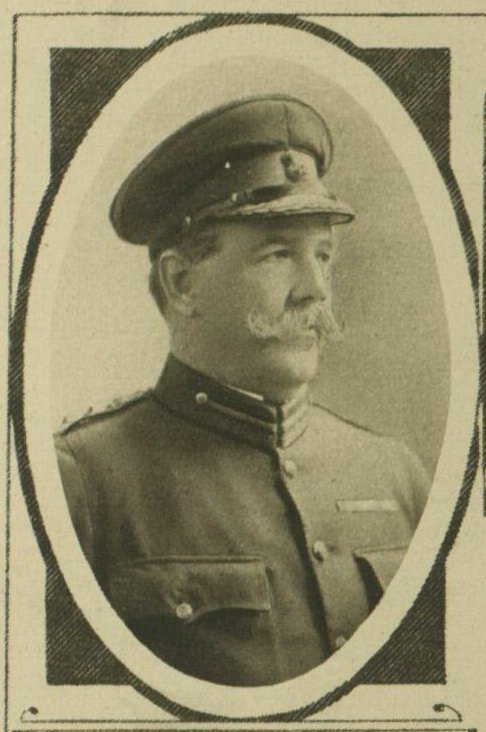 7 March 1907: Colonel Stacpole M.V.O., C.M.G. WO 76/70/20: John Stacpole. Regiment: 75th Regiment. Date of Service: 1874. Born: 1847. WO 76/84/74: John Stacpole. Regiment: 75th Foot. Date of Service: 1874. Born: 1847.